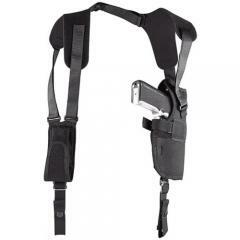 The Uncle Mikes Pro-Pak Series Shoulder Holsters are made of an extra thin laminate for concealability. Waterproof closed-cell foam padding aids in comfort while providing a moisture barrier. Smooth nylon lining further protects gun finish and aids in drawing and reholstering. Simple, super-lightweight harnesses are easy to put on and take off with fast, Velcro adjustments. Laminated harness yokes have soft, non-abrasive, non-slip material on the inside; and smooth, non-stick material on the outside that won't hand up on clothing. Non-stretch retention straps and molded thumb/finger breaks are adjusted by Velcro; adjustment tool included. The vertical carry of this Pro-Pak holster provides excellent concealment, comfort and retention, especially with large guns. Elastic onside and offside tie-downs are adjustable and removable. A little difficult to get adjusted so I advise future purchasers just be patient. Overall I am very pleased. This is the perfect fit for my semi-auto with a 3.25 inch barrel. The magazine holder works well. I used the holster in public with a friend and asked at any time can you tell I have a firearm, his response was no, not at anytime. It worked great for me. Plenty of adjustments to get the perfect fit. Will this holster work with a Taurus PT-111 Pro 9mm? If so, which configuration is recommended?